"Outstanding lectures with a simple plan & techniques; can lead you to a huge success in life and its influence never stops..."
Now the decision of studying MBBS from Russia; has turned into a worthy choice for medical students. Perm State Medical University (PSMU), one of the Top Medical Universities in Russia; is offering a golden opportunity to its enrolled students, for which they are majorly concerned. 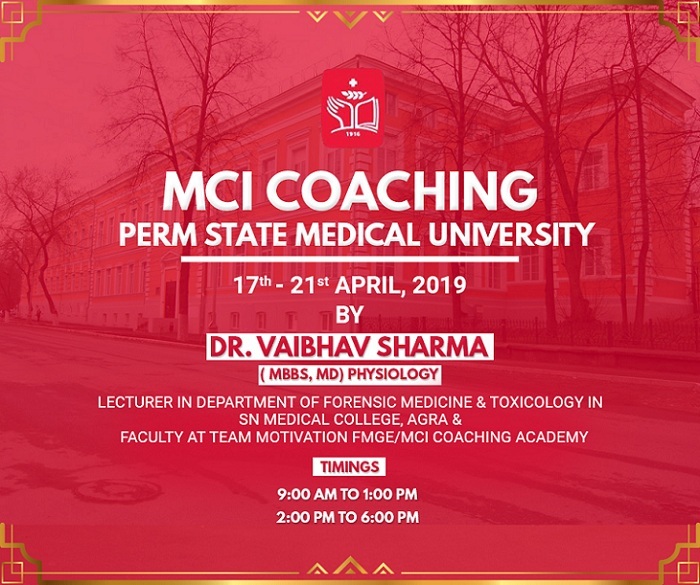 From 17th April 2019-21st April 2019, MCI Screening Test Coaching is going to be conducted at PSMU by Dr Vaibhav Sharma (MBBS, MD) - currently serving as a lecturer and part of Team motivation FMGE/MCI Coaching Academy. He will share his insights about preparations and techniques to attempt MCI Screening Test, while conducting the classes of Physiology simultaneously. Timings for the session will be in two shifts- 9:00 AM to 1:00 PM and 2:00 PM to 6:00 PM. We have initiated this unique idea of providing assistance to our students studying MBBS at PSMU with assistance from our associated partner- 'Rus Education'. These classes rely on the motto of boosting up the students for MCI screening test and to prepare them for Physiology stream. Dr Vaibhav Sharma will conduct many exercises in the classes that will help out the students to a great extent. All the relevant confusions/queries will be answered. We assure that the students will definitely have the brighter chances of clearing the exam and will be updated with the details of procuring a license for practising in India.